The challenge from WineLovers Discussion Group participant Dave E. was simple and direct: "Can we have a discussion of Beaujolais that does not include the phrase "serious wine" or disparaging remarks about carbonic maceration?" Most people expect to read about Beaujolais in November, when wine writers in search of a seasonal idea almost invariably pick up on the release of the Nouveau Beaujolais, the French region's new wine of the vintage just past. We're taking on the subject in August, though, in our online forum's monthly Wine Focus, because the excellent 2009 vintage of the named Beaujolais "Crus" has been released and will be hitting markets around the world soon. Just about every year, these are the wines that prompt wine commentators to reach for words like, well, "serious," in a thesaurus-impaired effort to find a way to distinguish the upper-tier Beaujolais from the simple, fruity Nouveau. "Bound and determined," "businesslike," "contemplative," "deliberate," "determined," "earnest," "genuine," "go for broke," "grave," "honest," "intent," "meditative," "no-nonsense," "pensive," "pokerfaced," "reflective," "resolute," "resolved," "sincere," "solemn," "steady," "stern," "thoughtful," "weighty"? Thanks, Thesaurus.com. This isn't as easy as it seems. As for "carbonic maceration," let's just skip right past wine-making technology today and go straight to the tasting notes. I recently tasted through the 2009s from the ubiquitous Georges DuBoeuf and found them unexpectedly impressive. While I wait for the 2009s to arrive at my local retailers, though, let's have a look at a couple of very decent 2008s: The widely available Beaujolais-Villages from Louis Jadot, and an earthy, artisanal Beaujolais "Terres Dorees" from J.P. Brun; my notes are below. This pairing mirrors a tasting of 2005s that I published in November (of course), 2006, Beaujolais, not Nouveau. You're warmly welcome in Wine Focus, and in all our WineLovers Discussion Groups. Click here to read and take part in the August Wine Focus discussion on Beaujolais. The discussions are open for public viewing, but you must register to post your comments and participate actively in the conversation. Registration is free and easy; we ask only that you join following our Real Names Real Format system. For your user name, enter your real name in the format "John Doe" or "John D", with the capital letters and the space. FOOD MATCH: The regional wine for the food-obsessed city of Lyon, Beaujolais has evolved as a versatile table wine well suited to a broad array of main courses from poultry and pork to beef and bold cheese. It made a fine pairing with green peppers stuffed with ground local pastured lamb and bulghur, topped with Gruyère and baked. VALUE: Excellent at this price, which to my pleased surprise was the same as I paid for the 2005 vintage in 2006. Note, moreover, that Wine-Searcher.com reveals many sources for $10 or less. WEB LINKS: Louis Jadot's Website is online in English, French, Japanese, Korean and Chinese. Click the flag of your choice if the system doesn't recognize your browser's resident language; then click "Wine Notes" on the home page and work your way through the lists and maps for information about the Beaujolais and Jadot's other wines. 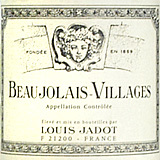 Louis Jadot Beaujolais is available through scores of vendors on Wine-Searcher.com. FOOD MATCH: Another versatile food wine. I served it with poulet l'estragon, with a gently poached local free-range hen and a velouté fashioned from its broth and garden tarragon. VALUE: Back up the truck at the wine shop door. WEB LINKS: Importer LDM Wines offers an essay about Jean-Paul Brun, including a short but well-tuned rant about past abuse in Beaujolais of 71B, an industrial yeast strain that imparts an artificial banana aroma in some of the region's wines. Find vendors and compare prices for J.P. Brun Beaujolais on Wine-Searcher.com. My source, Chambers Street Wines in NYC, has a modest supply of the 2009 Brun Terres Dorees at $15.99. 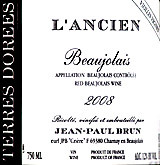 Use this search link to browse its inventory of Brun's wines including this Beaujolais.